Anthony Hopkins stars in this epic network television mini-series brings to life the precarious existence of early Christianity. The new movement is beset by violent opposition from without and constant turmoil from within. Two key leaders emerge -- Peter and Paul -- who struggle to keep the faith alive. This dramatic presentation follows the pair, together and separately, through three epochal decades. Included are the stoning of Stephen, the road to Damascus, their encounter in Jerum, their conflicts over how the word of Christ should be spread. 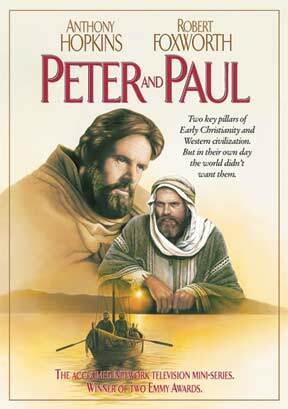 Paul°s travels to Asia Minor and Greece, Peter and Paul°s clashes over Jewish law, and Peter°s decision to follow in Paul°s courageous footsteps. The drama concludes in Rome in approximately A.D. 64 with the beheading of Paul and the crucifixion of Peter under Emperor Nero. Winner of two Emmy Awards: OUTSTANDING ACHIEVEMENT IN MAKEUP - 1981 OUTSTANDING COSTUME DESIGN FOR A SPECIAL - 1981? ?